Ok, on the advice of one of our Pioneer RV Park neighbors, we went out for pizza at the Gaff in Port Aransas. Pizza was very good, but we missed the Belt Sander Race so here’s a link to a previous Gaff Belt Sander Race. NEXT: Jeepin on Padre Island. We drove on the beach to Milepost 30! Looks like really good pizza. You’re also looking good, Jan. Wow! 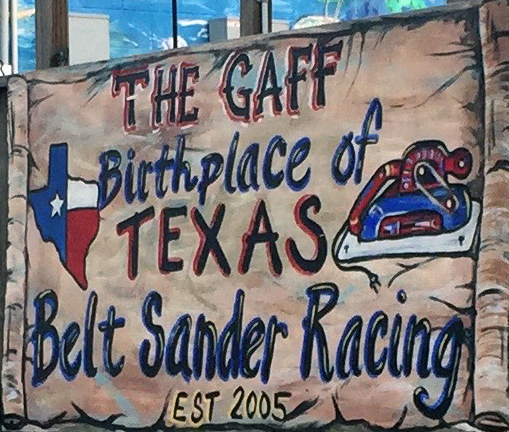 Have never before heard of belt-sander racing. A Texas thang? I think it’s more than Texas. Olympic event, maybe? enjoyed your pic… yeah, that pizza looked really good for sure.